Registration is $5 and includes refreshments. Awards to top 3. "Hey guys. 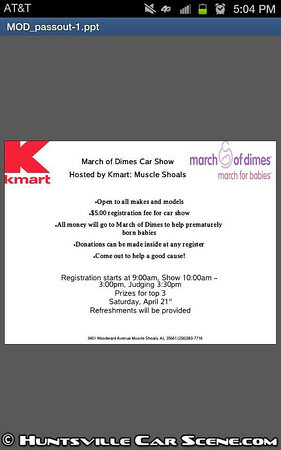 Going to be holding a car show to help raise money for the March of Dimes. Going to be held Saturday April 21st starting at 9:00am. Refreshments will be provided. Looking to raise money for this awesome cause. If you aren't familiar with the March of Dimes more info can be found at www.MarchofDimes.com. My number is 256-810-3672 or more info"